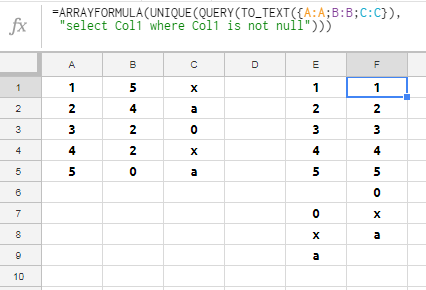 Google Sheets has a UNIQUE() function which when given a column of values, will output a column of all unique values. This works well for column-specific data, however, you have multiple columns and rows of data that needs to be summarized, this won't work. This is because if you include a 2-dimensional range into UNIQUE() the end results are two dimensional, with only each column being summarized. Is there a function or way to summarize all values across an entire 2-dimensional range? I have a large list of businesses. Each column is a type of business, and each row contains values of business names. I need to create an end-list of all businesses that are provided throughout the entire source sheet. I don't need unique values per column. I need unique values across the entire document. 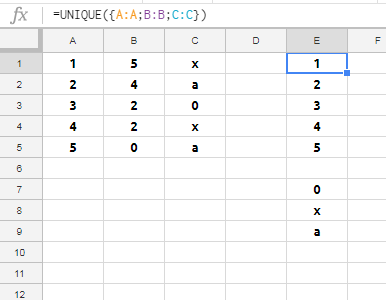 In Google Sheets, can you apply a regex to a generated range?